When you do that first big supermarket shop just after moving into your new house or halls of residence, it's very easy to get carried away. The freedom of being able to buy, cook and eat exactly what you want for every meal is often a little too tempting and, like a kid in a sweet shop, you might end up putting absolutely everything you fancy in the shopping trolley. However, it's important to remember that you can only eat so much food. While cans and dried goods will keep for a long time, fresh groceries soon start to deteriorate and you'll quickly end up with a kitchen full of rotting vegetables if you're not careful. If you want to make the most of your limited funds, it's good to remember that the supermarket isn't the only place to buy food. While it's great to use the big stores for all those half price specials and buy one get one free offers, you should try to be clever about where you shop. As a student you'll have a bit more time on your hands to do your shopping so you should really make the most of: it's worth the extra effort to hunt out those elusive bargains! For example, ethnic specialist shops and mini markets are a great place to go for more unusual fruit and vegetables. You'll also find it much cheaper to buy things like spices and rice here as they are sold in far larger quantities than supermarkets so you'll save by buying in bulk. Your local greengrocer is also a good place to shop. Fruit and vegetables are best eaten as fresh as possible so if you have a local shop, then buy what you need every couple of days on your way back from college. Farmers' markets are springing up all over the place so look out for any near you. This is where you should buy all those great seasonal British products and you should be able to pick up some bargains if you choose the right things. Here are a few quick tips on how to shop economically but still have a deliciously varied diet. 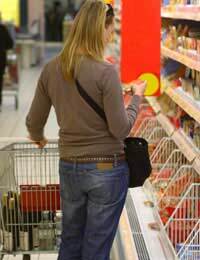 Don't go shopping when you're hungry: always go just after you've eaten and you'll be less likely to cram the trolley full of unnecessary items. Take a calculator to the supermarket with you and add up everything as you go. That way, you can really stick to your budget and you won't have any nasty surprises at the checkout. Choose seasonal fruit and vegetables where possible and choose dishes that will make the most of these. Only buy what you know you're going to be able to eat. Alternatively, if it's cheaper to buy in bulk, then plan some meals that can be made and frozen for later use. Use local market stalls and traders for your fruit and vegetables; if you go towards the end of the day you'll pick up plenty of bargains.